February 20, 2007: One pole of the sun is cooler than the other. That's the surprising conclusion announced today by scientists who have been analyzing data from the ESA-NASA Ulysses spacecraft. 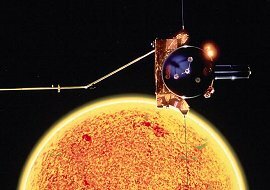 Ulysses is the only ship in the NASA or European fleet capable of flying over the sun's poles, a result of the spacecraft's uniquely-tilted orbit. Its ability to study the sun's unexplored polar regions is prized by solar physicists. Ulysses' first polar flybys in 1994 and 1995 revealed the asymmetry—"a 7 to 8 percent difference in temperature," says Ulysses science team member George Gloeckler of the University of Maryland. The measurement was both mysterious and a little hard to believe. What would make the sun lopsided in this way? Right: Ulysses over the sun's South Pole, an artist's concept. Credit: ESA. There's still no definitive answer to that question, but now at least researchers know the effect is real. Ulysses has returned to the sun's South Pole in 2007 and "recent observations show that the average temperature ... is virtually identical to what we saw 12 years ago," says Gloeckler. Taking the sun's temperature is tricky business. The spacecraft can't descend to the surface and insert a thermometer. Instead, Ulysses samples the solar wind at a safe remove of 300 million km. "We measure the abundance of two oxygen ions found in the solar wind. The ratio O6+/O7+ tells us the temperature of the gas," explains Gloeckler. He is the principal investigator of the instrument onboard Ulysses that does this, the Solar Wind Ion Composition Spectrometer or "SWICS." According to SWICS, the average temperature of the sun's polar wind is about one million degrees C. But over one pole the wind is about 80,000 degrees cooler than over the other pole. Researchers believe the solar wind at Ulysses is telling them something about polar conditions close to the surface of the sun. "The solar wind comes from the poles," explains Arik Posner, Ulysses Program Scientist at NASA headquarters. "The sun's magnetic field opens up over the poles and allows some of the sun's atmosphere to escape." These openings are called "coronal holes," and the hot atmosphere that rushes out is the solar wind. Back to the original question: What does the temperature difference mean? "Perhaps the structure of the sun's atmosphere over the two poles is different," he speculates. In the case of the sun, the difference is not land but magnetism. Apparently, something about the sun's north magnetic pole keeps the solar atmosphere above it a trifle cooler. Proof: The "cool spot" follows the north magnetic pole when the sun's poles flip. "The sun's magnetic poles have reversed polarity since the 1994 flyby—an effect of the 11-year sunspot cycle," notes Posner. Lo and behold, "the temperature asymmetry has also reversed. So it appears to be a magnetic phenomenon." When Ulysses finishes its current South Pole flyby, it will proceed to the other end of the sun for a North Pole flyby in early 2008. This will provide more clues to what's shaping up to be a very cool solar mystery. South Pole Flyby (Science@NASA) -- the ESA-NASA Ulysses spacecraft is flying over uncharted territory, the mysterious South Pole of the sun. Above: Ulysses' third orbit around the sun carries it over the South Pole in February 2007 and the North Pole in early 2008. Cold Peril -- (Science@NASA) The NASA/ESA Ulysses spacecraft is perilously cold as it begins a newly extended mission to study the sun. A Star with two North Poles -- (Science@NASA) Sometimes the Sun's magnetic field goes haywire. The Ulysses spacecraft has discovered how the effects are felt throughout solar system. Solar Flares on Steroids -- (Science@NASA) Solar flares that scorch Earth's atmosphere are commonplace. But scientists have discovered a few each year that are not like the others: they come from stars thousands of light years away. The Ulysses spacecraft is crucial for pinpointing these "solar flares on steroids."